There's not a lot of working woodcutting scripts for rs3 so I decided to make one. -For Regular trees start the script at Varrock west bank. -For Oak trees start the script at Draynor bank. -For Willow trees start the script at Draynor bank. -To Chop yew trees at Edgeville, start the script at Edgeville bank. -To Chop yew trees at Varrock Castle, start the script at the northeast side of Grand Exchange. -To Chop yew trees at Lumbridge Combat Academy, start the script at the Combat Academy Bank. Right now the script only supports power chopping regular trees. I will add support for more trees later on if someone requests it. if anyone needs a specific location please let me know and I will add it. Thanks man this is much needed! Please let me know if you would like me to test it. I have multiple accounts at 75+ woodcutting. A simple scrpit for yew would be a great addition. This looks sweet. Looks like there might be an issue triggering the bank task when your inventory is full (or maybe it couldn't find a route back to the bank? ), though. 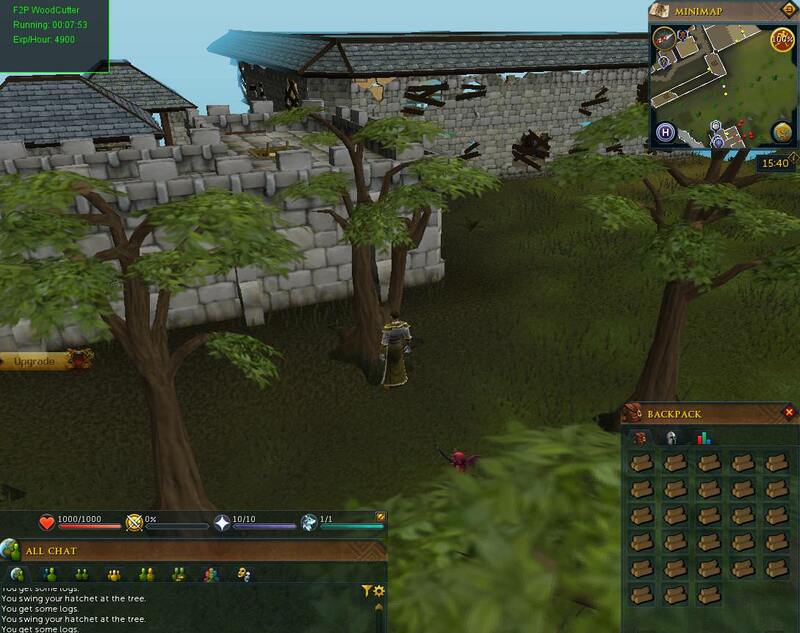 Here's a screenshot of where I stood for a while after a full inventory, chopping normal logs at Varrock West. Where did you start the script? Also in the newer version of the script, I think that problem is taken care of. Ah, I had to walk over and start it near the trees. When I started it in the bank, I'd immediately run up and chop the tree next to Solomon first, but I guess my WC level was low enough that it took more than a few chops and I got into a loop where he'd chop the tree, hit it once or twice, then try to run to the next tree, then immediately run back to the tree to chop it again since it wasn't cut, etc. Now that I've hit level ~15 woodcutting on this account it doesn't seem to be an issue anymore since I can chop the trees near Solomon so quickly. It was pretty reliably happening (every time I started the script) originally. Ah, I had to walk over and start it near the trees. When I started it in the bank, I'd immediately run up and chop the tree next to Solomon first, but I guess my WC level was low enough that it took more than a few chops and I got into a loop where he'd chop the tree, hit it once or twice, then try to run to the next tree, then immediately run back to the tree to chop it again, etc. That issue's been fixed in the newer version. I'm just waiting for an admin to remove my script so I can upload the newer version. Try doing oak and willow trees for now. They should work without any problems. Edit: Never mind, I realised your waiting for them to remove it haha. As a SW you should have access to your own private repo so shouldn’t need admins to approve it. I know that but my old script is still on the openSDN. So I don't want to push the updated version and create a duplicate. Normal trees Varrock west doesn't work. Simply closes the script before it starts. Normal trees at Varrock West banking option will work for only 3 loads before it stops and freezes in the bank. Not sure if its something on my end, but I thought I would let you know. Thanks for letting me know. Does this happen every time or is it random? If possible can you share a picture of where the script gets stuck? I'll try to update the script as soon as I can. Edit: The Scripts Anti-bot sometimes takes a break which can last for 2 mins, if the same issue occurs again can you wait a bit to see if the script continues or not? Mine gets stuck at the cooking guild bank every 5 times. Have to click on the minimap near the varrock bank to get it away from there. When chopping normal trees in Varrock my charcter does not bank. It tries to bank at a different bank that does not allow it to go in. Any suggestions? I would like if u can make this script useless to trees in the GE there is not common bot and i can be safety there =)!